A very short plant barely an inch high. 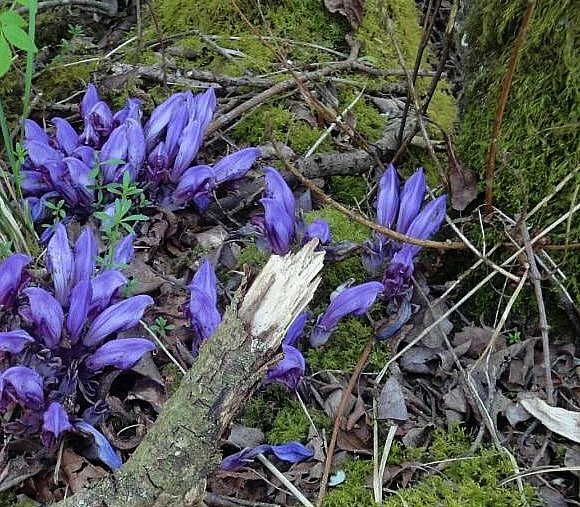 Is saprophytic, growing on the roots of certain trees such as Alder, Poplar and sometimes Beech . With highly zygomorphic flattish cowls. Like rotating ventilator cowls atop old buildings, they all face more or less the same way. 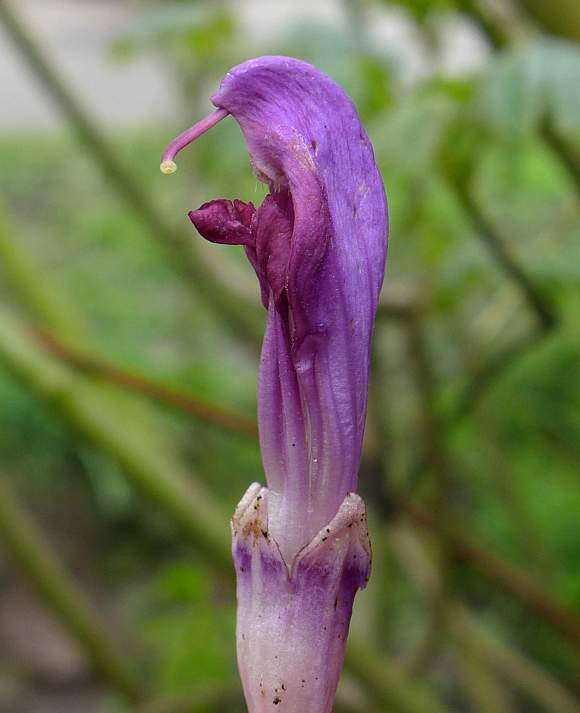 They emerge from a 5-pointed sepal tube like many other flowers. 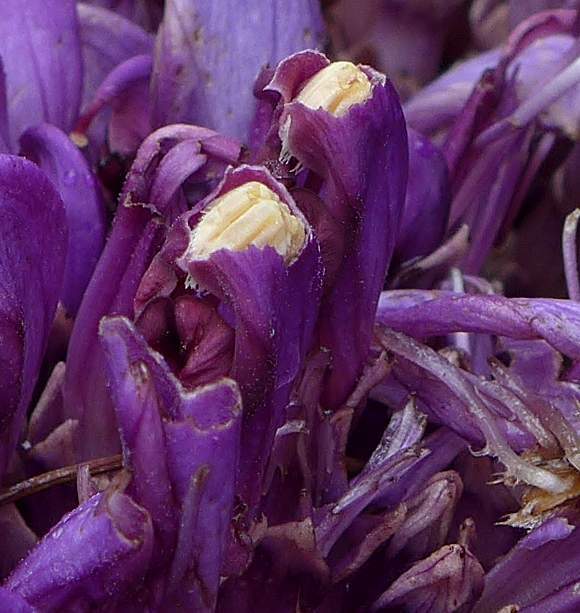 Empty sepal tubes, the flower probably pulled out by other wildlife. These two specimens have had the top part of the cowl eaten away exposing the four cream-coloured hairy anthers. 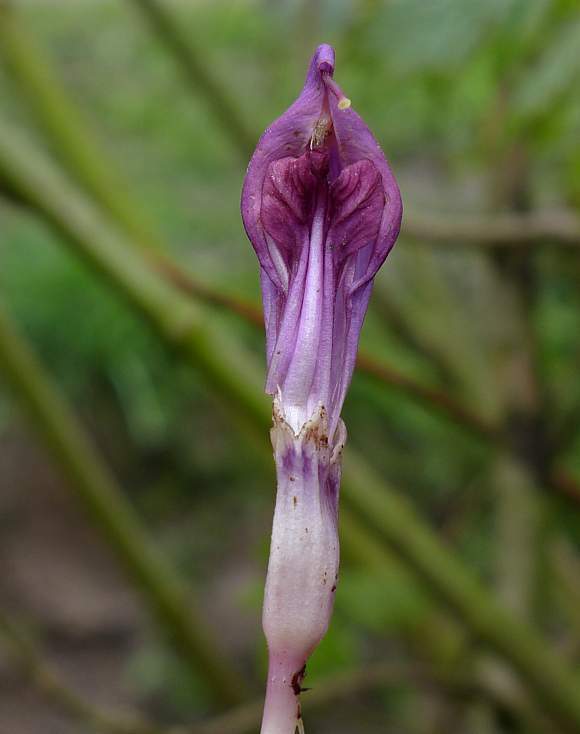 They are much longer than what appears, the sepal tube and other whitish parts being mostly hidden beneath leaf litter and by crowding from other plants, including themselves. 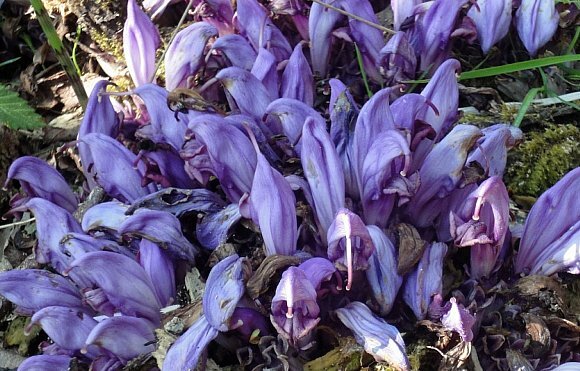 All have a long curled-over cowl, a single style protruding from the top, and a deeper-purple tongue. 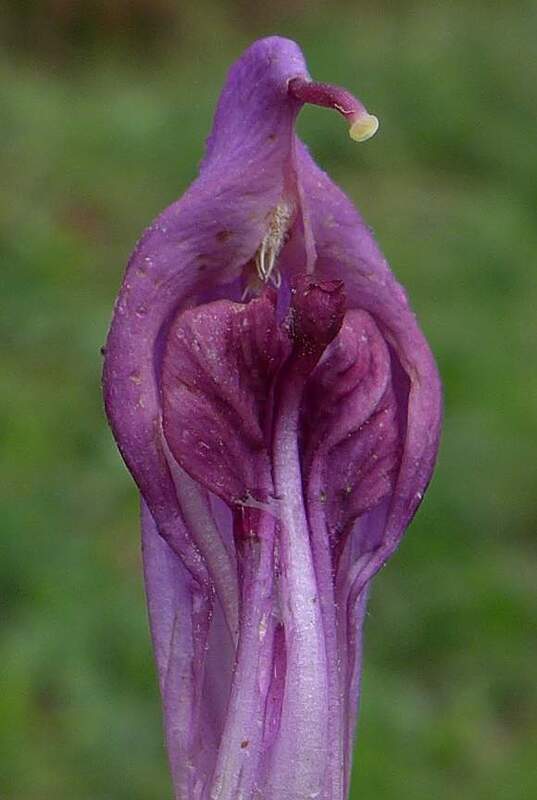 The tongue splits near the top. Just above it are probably the four hairy anthers mostly hidden within the cowl. The style at the top has a cream-coloured disc-shaped stigma. 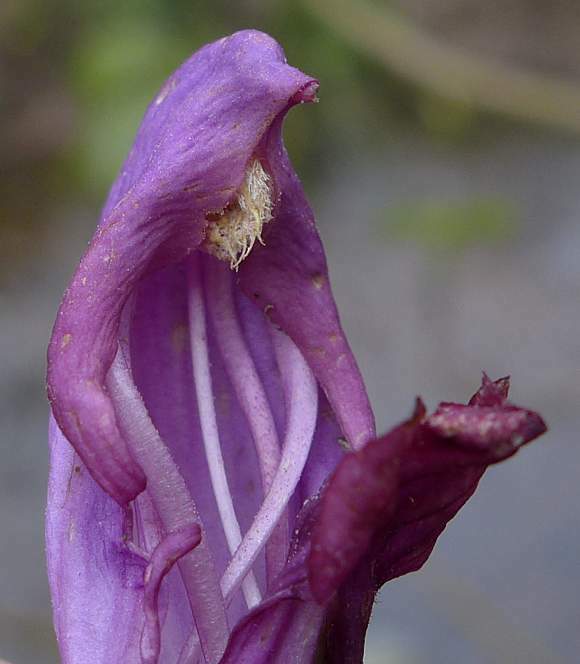 Like some Hemp-nettles (such as Large-Flowered Hemp-Nettle or Common Hemp-Nettle), within the cowl are four white tubes rising up to the roof holding four hairy male organs (anthers) aloft within the cowl. Presumable insects going inside the flower brush against the pollen and later transfer it to a stigma (in this example both part the protruding part of the style and stigma has broken off). Another view of the 5 tubes within, being 4 stamens and one style. 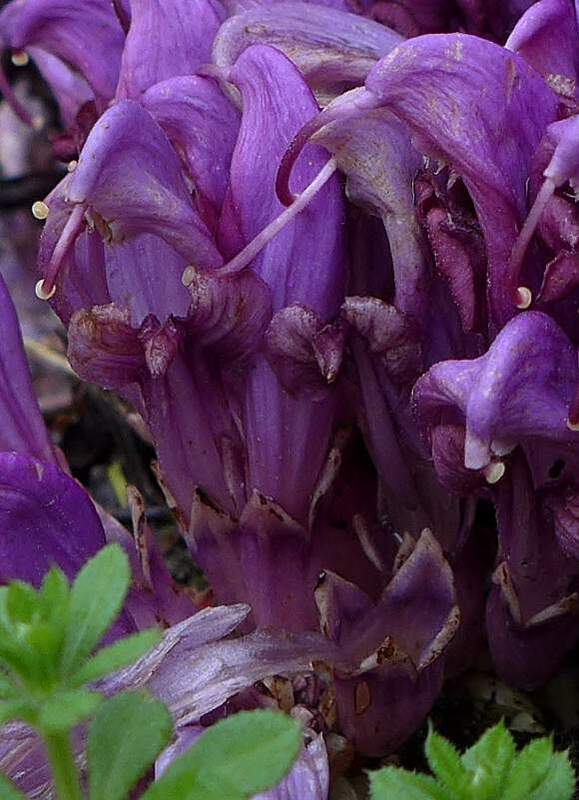 Some similarities to : Toothwort (Lathraea squamaria) which is much taller with a tier of similar-shaped flowers and has cream coloured flowers and also starts to flower a little later. 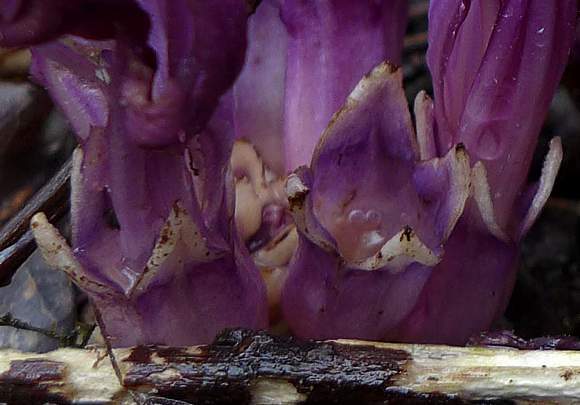 Purple Toothwort is stemless arising straight from the rhizomatous rootstock. Devoid of chlorophyll and thus any green coloration it is saprophytic, un-able to photo-synthesize itself, and hijacks the root systems of other plants for nutrients. Surprisingly, it seems to be grown as a garden plant, since some books proclaim that it is occasionally naturalised, for example, on willows. 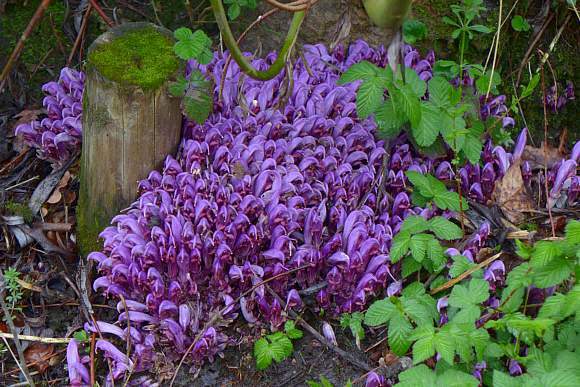 If the seeds are planted in a garden near to a suitable host plant, it may be 10 years or so before any of the purple flowers appear. Firstly the (very brittle and deep) roots have to find a host and tap into it. Lacking chlorophyll, leaves would be pointless, and it possesses none. 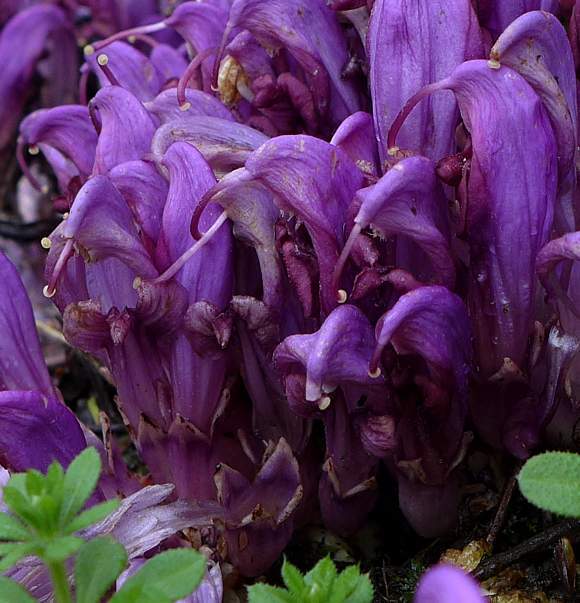 Purple Toothwort is a perennial parasitic plant that is completely devoid of chlorophyll and therefore incapable of photosynthesizing. It parasitizes the roots of Alder, Poplar and Willow . 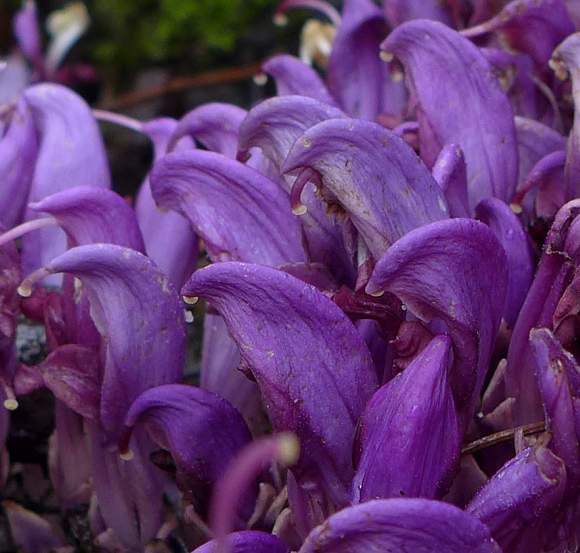 Purple Toothwort might also be a borderline carnivorous plant, meaning that it can physically trap insects but only might be capable of digesting them and absorbing the nutrients, or partially absorbing them. Obviously, the more ways it has at its disposal for obtaining nutrients the better, and maybe carnivory is just supplementary until it can parasitize a nearby plant for a more reliable supply of nutrients. But it might not be protocarnivorous at all. 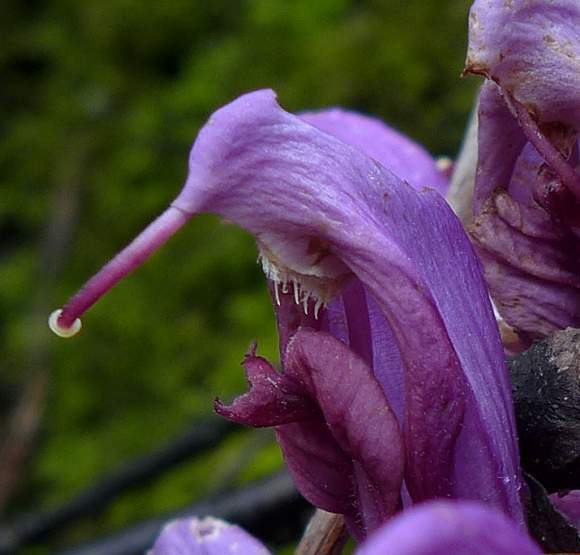 The large amounts of nectar the plant produces is, highly unusually, alkaline and smells of ammonia, NH3, which has an unpleasant odour and is poisonous. It contains the ammonia as ammonium hydroxide, NH4OH. The ammonia is thought to be produced from an initially slightly acidic exudate containing amino acids and enzymes. The nectar is contained within the nectarine chamber at the base of the corolla and which narrows at the top and is protected by a barrier of hairs. A water-jacket around the base of the corolla formed by the calyx keeps the nectar chamber cool by means of its own evaporation, limiting the evaporative losses of nectar. This water jacket must therefore be topped up by the plant. The nectar also contains 35% to 38% by weight of sugars. Bees pollinate the flowers attracted by the nectar - they tolerate the ammoniacal smell, which seems to exist to deter other insects, particularly ants. The fruit it bears is 2-valved with each containing 4 or 5 seeds which are explosively released as the fruits split open (dehiscence).